2 Stews: Happy Birthday, Julia! As a young wife and mother I began cooking meals on a regular basis. My earlier vagabond traveling lifestyle allowed for experimentation in many food fads. However, my Julia Child cookbook, “Mastering the Art of French Cooking” traveled from the east coast to the west coast and back again. Along with a few other treasures packed in cardboard boxes, it was jammed into my yellow VW bug for the journey. Once settled into our stable household, it became a regular source for my cooking. My young daughter loved cheese souffle, quiche with ham and leeks and Boeuf Bourguignon. My son preferred chocolate mousse and classic roasted chicken with herb de Provence to any more complex French concoctions. The first flourless chocolate cake I made came from Julia Child. And Steak Diane...well, it had my name all over it! 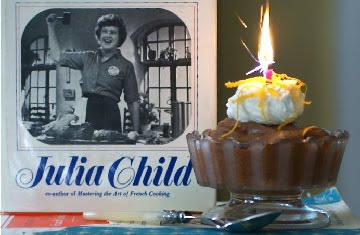 I watched Julia Child on PBS as she came to us from 15 miles away through the airwaves. It was real and alive with her singsong voice and exuberant ways. She drop kicked perfection out of the door, and invited in fun with her rich butter and cream filled meals. In honor of her birthday, I thought I’d make her Chocolate Mousse. I knew I’d have plenty of teenage boy's mouths willing to celebrate her day. 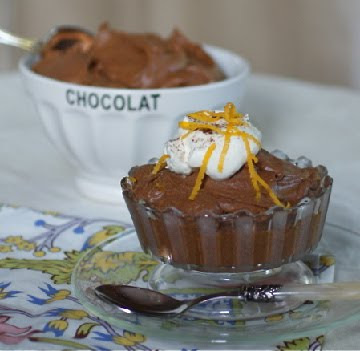 In many French restaurants, Chocolate Mousse is often served alongside a Mother Bowl to spoon this light confection from. I think next time I’ll have to make a larger bowl! In a 3 qt. 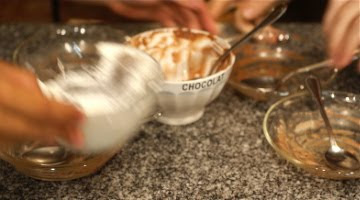 mixing bowl, beat the egg yolks and sugar together until mixture is thick, pale yellow, and falls back upon itself forming a slowly dissolving ribbon. Beat in the orange liqueur. Then set mixing bowl over a pan of not-quite-simmering water and continue beating for 3 to 4 minutes until the mixture is foamy and too hot for your finger. Make sure the bottom of the bowl does not touch the water. Then beat over cold water for 3 to 4 minutes until the mixture is cool and again forms the ribbon. It will have the consistency of mayonnaise. Melt the chocolate with coffee over hot water. Remove from heat and beat in the butter a bit at a time, to make smooth a cream. Beat the chocolate into the egg yolks and sugar, then beat in the optional orange zest. Beat the egg whites and salt until soft peaks are formed. Add the sugar and beat until stiff peaks form. Stir one fourth of the egg whites into the chocolate mixture, and then fold in the rest, being careful not to deflate the mixture. Turn into dessert cups and refrigerate for at least 2 hours or overnight. Bring to room temperature before serving. Serve with lightly sweetened whipped cream. Makes about 5 cups, serving 6-8 people. Happy Birthday, Julia! Thanks for the memories. 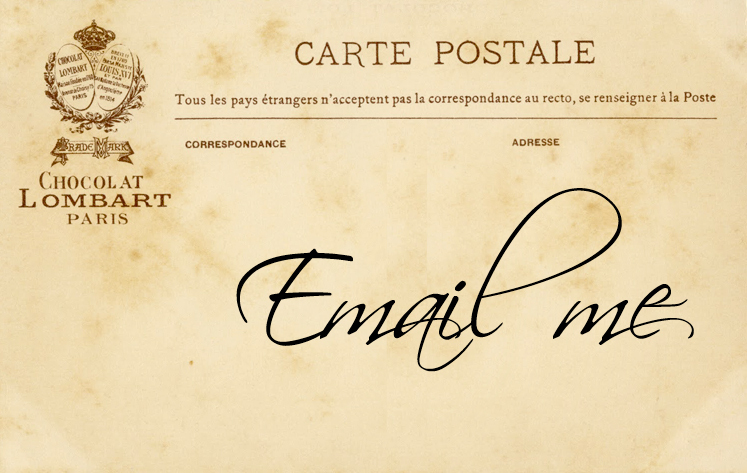 Diane - This is a "Thank You" note from my husband. I made your Mushroom Cheese Crepes last night and he was in heaven. I bemoaned that I don't have a crepe pan - he said "Go and buy one - I love these!" So Thank You from me as well. The Chocolate Mousse - next on the list. i love this post, you so have the IT factor for entertaining, steak diane... cute cute cute! i had the same book, same car too~ i never mastered cooking to your art form, but i remember watching her with my dad when i was little. and that mousse, that could so be my meals for the day... all of them! great post! I am sad I don't have her books...One day! But yours look loved! Pretty post..Happy Birthday Julia!!! I remember that car and that trip! How nice to have teenage boys around to eat that mousse! Lovely post, it brings back so many memories! Happy Birthday Julia! I love your photos! What a great post. I love Julia, too. I need to break out my set of Mastering French Cooking and see what my next Julia lesson is! 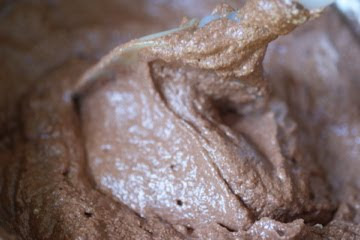 I love this mousse recipe...it was the first I ever made. 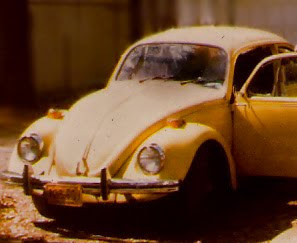 I had the same yellow bug but it was a rag top...wonderful youth! I saw your entry yesterday via Food with Style. I am planning on making this recipe and had purchased the ingredients prior to reading your post. 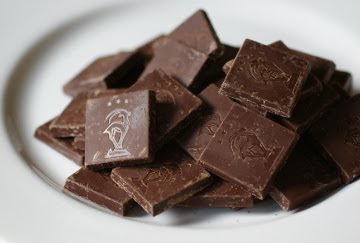 Your post calls for bittersweet chocolate and my version of MtAoFC v1 lists semisweet chocolate. Have you ever made it with semi-sweet chocolate? Oh Ladies...who would have ever thought we'd be bonding over VW Bugs and Julia Child!! They've both stood the test of time! What a lovely post. :) You can never go wrong with one of Julia's classic recipes. 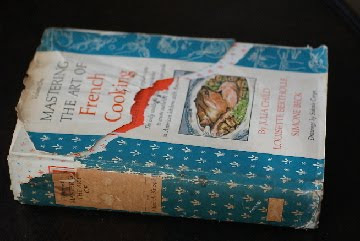 Your copy of Mastering the Art of French Cooking looks like it is in the same condition as mine: much used. I always loved Julia's shows, especially the flubs; they made her so human! The turkey that hit the floor was classic! The show on making puff pastry was one that was very liberating. At the end of all of the rolling, chilling, folding, over and over, Julia said that making it was great, but there were some very good versions available in the grocery freezer and she used them quite often. I decided right there that if the frozen was good enough for Julia Child, it was good enough for me. I am never without a package in the freezer and I, too, use it often. 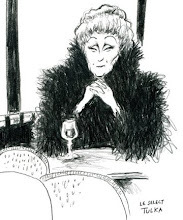 Even with all of the media attention to cooking these days, there will never be another Julia.